It’s hard to get you’re head around Tim Berners-Lee’s semantic web and what it might actually mean in real terms for web users, but today I finally saw two examples that give a glimpse of the way the web may work in the future: Calais and Apture. They’re exciting because? Well, Calais automates tagging and the creation of metadata. Which doesn’t sound that exciting, until you realise that in practical terms that makes content much more findable, as it begins to standardise not just your content, but everyone else’s. Calais’s mission doesn’t sound that dissimilar to Google’s, it is to: “make all the world’s content more accessible, interoperable and valuable”. Apture, by contrast, isn’t an automated system, a human is still required. Why? Because, it’s about storytelling, adding additional content (without leaving the current page) to your text. 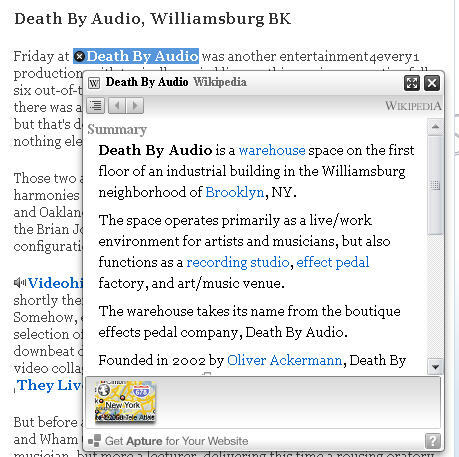 Apture uses small, clickable icons to indicate when there is more information to be had on a page – be it a map, wikipedia entry, video, additional text or audio file. It adds layers and explanations to your story, as can be seen in this example and the image below. Tim – I think I finally begin to get it. Previous Previous post: What makes successful online advertising?